Original soundtrack the 1977 film "Star Wars" (later renamed/rebranded/remarketed as "Episode IV: A New Hope" within the Star Wars saga). 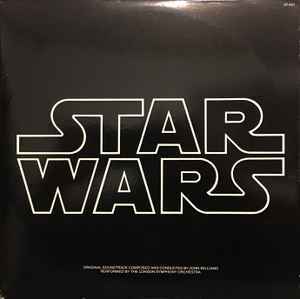 Has distinction of being the only "Star Wars" OST to be distributed by the film distributor's own record label - 20th Century Fox Records. Later two film's sequels' soundtracks were distributed by RSO, as 20th Century Fox Records fell into financial difficulties, and was finally liquidated in 1981 (with its musical catalogue being sold to PolyGram). Original 1977 USA pressings are on 20th Century Records, which was rebranded in 1978 as 20th Century Fox Records, so those pressings date from later in the 1970s. The repressings from the 1980s are on RSO. Tracks A1 (in its shorter form) and B5 were also released on 7 inch single. First expanded release was available as part of the 1993 4-CD compilation set Star Wars Trilogy (The Original Soundtrack Anthology), but the most comprehensive version so far (supposedly including the complete, remastered film score) was released in 1997, coincidental with the "Special Edition" release of the original film trilogy. This 2-CD set was re-released in 2004 (and later) with different artwork. this pressing is incredible. Very quiet vinyl, very dynamic mastering. Transients of plucked strings sound very punchy and the percussion sounds massive! Go Canada! I mean, come on. This is only one of the single most iconic motion picture scores of all time! How does one say anything unkind about it? I have the exact same edition, only my copy says "made in Holland". Is there "Binary Sunset" in this edition? Maybe with a different name? Does anyone else possess a press with the etching on Disc 3 reversed? I came across an album version with the searchlight label, but the print is a bit bolder than other labels of this type and, more importantly, “SIDE ONE” and underneath it “STEREO” are to the left of the spindle. “2T-541” and “(M-2-541-AS)”, are to the right of the spindle on Side A, with consecutive BS, CS and DS on each side. Can’t seem to find it in Discogs. Think it’s worth entering? Good sound quality to an epic soundtrack. Great collectors' item picture LPs too. I have this record, with T shirt order form and insert, but not poster or booklet. Everything looks exactly the same except my center labels are the same as the RCA Club Edition, however they don't have the same code written on them that the club edition has. Anyone have an idea? I also have noticeable hiss on right channel that seems to correspond with record rotation on first disc. Is there an exchange program from the distributor? My local shop isn't really interested in exchange - only refund...i'd really like a decent copy of these!